Android and iPhone are now the most popular mobile operating system on the planet. There are all kinds of mobile and desktop apps built for them for facilitating the usability. However, as the past giant Symbian, powered by nearly 70% of mobile phones in early days of 2000, now comes to an end when Nokia officially announced the statement in late 2013 after Microsoft's acquisition. As a long time Nokia users, I have no choice left for me because there are no new app or game developed for Nokia phone for the past year. It's now only being used as a phone call machine. I pre-ordered an iPhone 6 early this month and got the long-waiting device today. I need to set up everything from start, as I have no prior experience with Apple's service. One of the most important things is how to transfer my contacts and text messages from old Nokia phone to the new iPhone 6. It would be an annoying task if I manually typed my 300+ contacts onto the iPhone. Considering that a large number of users get the Nokia phone in hand and the Apple iPhone device continues to grow in numbers, when you switch your Nokia to iPhone 6, you may be confused by hundreds of contacts transferring task, A growing number of people are finding themselves in need of transferring contacts in between the two devices. This program is an integrated data processing intelligence suite that provides a wide range of functions to help you process the data. Here you need to select the "Switch" option, it will automatically detects the devices when they are well attached, meaning the computer recognized both devices. After that, it proceeds to the next step of data analysis. It takes a few minutes to scan the content stored on your N8, including contacts, text messages, and photos. In this step, source phone is the device storing the contacts and destination phone is the device receiving the contacts. Click the Flip button to change the device if they are not in the right position. 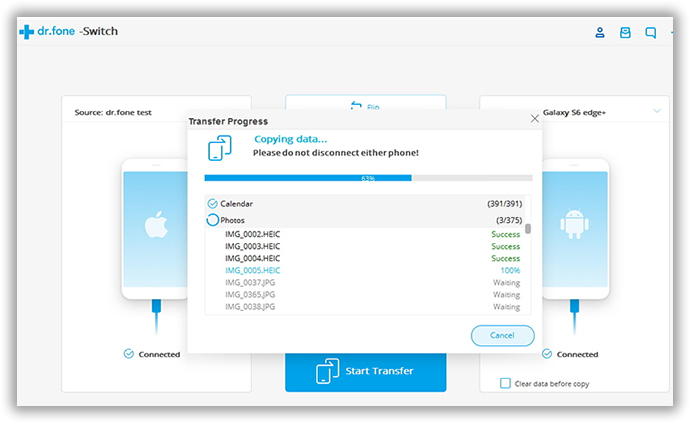 Then select the file you want to transfer to iPhone device. In default, the program will transfer all the possible files it detected. However, in this case, we only need to transfer contacts only. Uncheck other items and only leave contacts checked. Then click the Start Transfer button to start the transfer process. 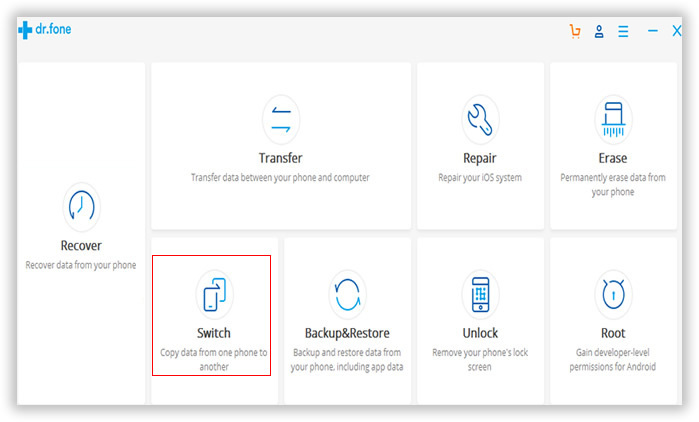 Usually, it only takes a few minutes to fully transfer the contacts even you have hundreds in your old phone. Before using this app, I have tried 10+ of similar programs with the same functionality. The fact is that Phone-to-Phone Transfer is the most powerful and user friendly among its competitors. None of my contacts was missing after the transfer which I manually checked some of them. Besides, the transfer can be done in mutual, meaning you can also transfer contacts from iPhone to Nokia. What's more, this program is still useful in future if you want to transfer content between Blackberry and Android. 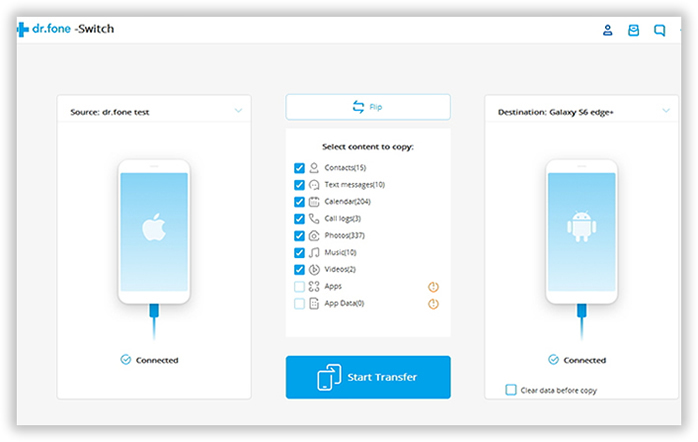 I dare to day this is the best app for file transfer among different smartphones.